37 cars took the green flag in the morning sun at Autodromo Nazionale di Monza. This is the first time the NEO paddock races at this historic track. The speeds are very high, the road is bumpy, and the braking zones are challenging – especially with the different braking capabilities of the various classes. The times from qualifying were very close throughout the top 10 in each class. The first hour of the race was hectic. Fortunately the drivers got in a flow quickly and it was a good race overall. Multiple teams showed some great pace in practice and qualifying. It promised to be a true royal rumble with multiple teams having a shot at the win. At the start of the race Team Chimera lost their opportunity when they stalled the car at at the pace lap, forcing them to tow back to the pits. Radicals Online lost their shot at the victory due to an early race incident between cars ahead of them. The number 2 car had nowhere to go and got hit, which cost them about a minute. 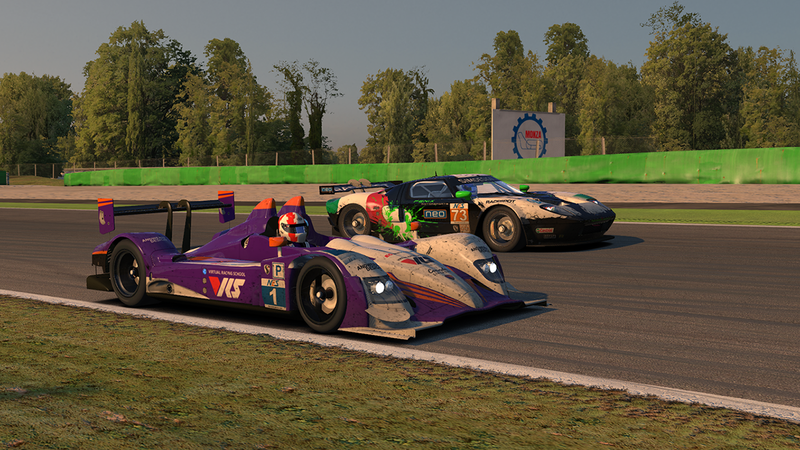 In the end it became a dog fight between VRS Coanda Simsport, Friction Racing and Pure Racing Team. In the end it was VRS Coanda Simsport who had the pace and the best strategy to take their third victory of the season. Friction Racing finished in second position. Pure Racing Team improved their speed since Spa. 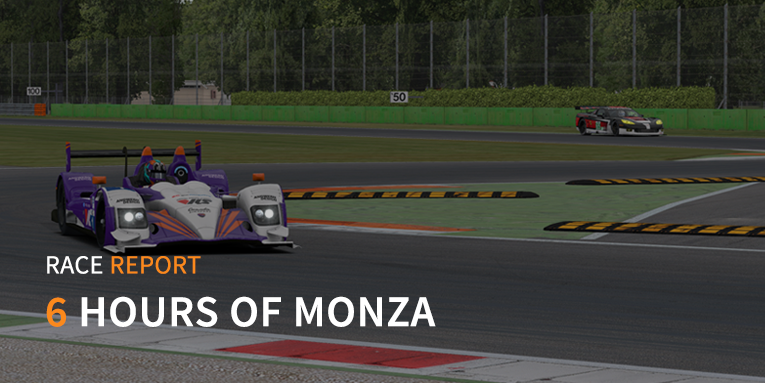 Also at Monza the 7 car had a good pace, which resulted in a third place finish for the German based team. Radicals Online fought back to fourth position after the early problems. Geko Vortex SimRacing finished fifth. Gathering of Tweakers 1 took the sixth position, which they were happy with. 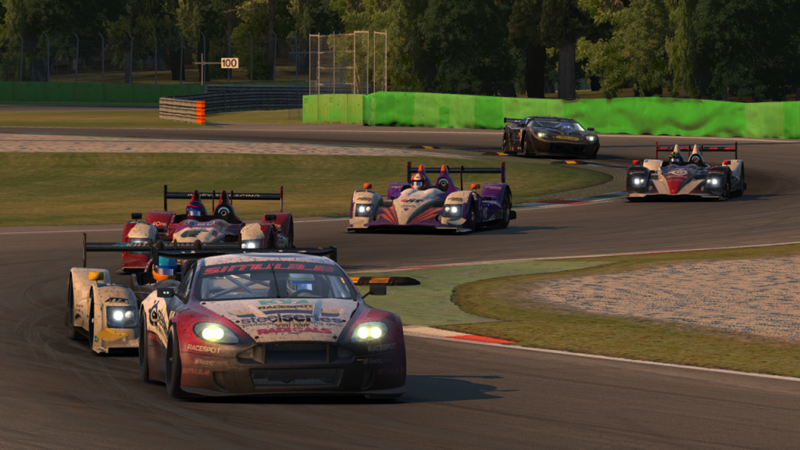 OdoX Motorsport had their best finish of the season at Monza, finishing in seventh. It is great to see a team improving their traffic management like car 14 after a troubled opening to the season. Finally in eighth it is Team Chimera who had to do damage control this race. Looking at the points standings, it is VRS Coanda Simsport who extended their lead to 35 points over Radicals Online. Friction Racing is now in third with a gap of 20 points to fourth place Geko Vortex Racing. In the first half of the race there was a new face in the lead. Hammer Down Racing had great pace here at Monza. The track suited the Corvette very well. Unfortunately for them halfway in the race Thrustmaster Mivano Racing took over the lead in GT1. The 31 Aston Martin held of the 65 Corvette for the race victory. This is Mivano’s fourth victory of the season. Hammer Down Racing finished second. Falcon-GP finished on the final step of the podium after a pretty anonymous race for them. Excelsior Racing Team has good streak going on. At Monza they finished fourth, which is their third top 5 finish in a row. SRN Motorsports finished fifth. FRT Hawkers fought back to sixth after a penalty for avoidable contact in the first hour of the race. IRDK Endurance had the pace in the practice sessions and started in third. In the race the team held second place for the first hour. Bad luck struck them in the race, again. After getting hit by an other car they lost a lot of laps to the GT1 leaders. Seventh was the highest they could finish here at Monza. The 54 Aston Martin of Team Chimera finished in eight, after major troubles in the early stages of the race. This is their worst finish of the season so far. Thrustmaster Mivano Racing has now a solid lead going into the season finale. Hammer Down Racing is trailing by 43 points and Radicals Online GT1 by 46 points. Hammer Down Racing and Radicals Online GT1 both need a miracle to win the championship. In racing it is not over until the final checkered flag drops. The battle for the top 8 is close, where positions 7 to 12 still can change drastically. Keep an eye to this battle as well. In GT2 it was a battle for the draft in the opening laps. Once the faster classes went through the GT2 field, the cars got split. 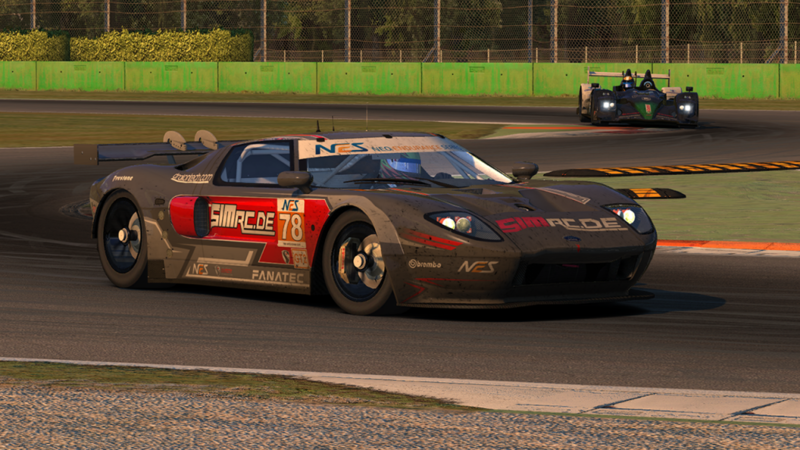 At the sharp end of the field the battle was between Fenix Motorsports FGT and SimRC.de. In the end it was Fenix Motorsports who had the better pace and took the GT2 victory. SimRC.de settled for second and this was enough to clinch the championship. Torrent Motorsports finished in third after a solid race without any major problems. IRDK Assault Racing finished fourth after a spin in the early stages of the race. 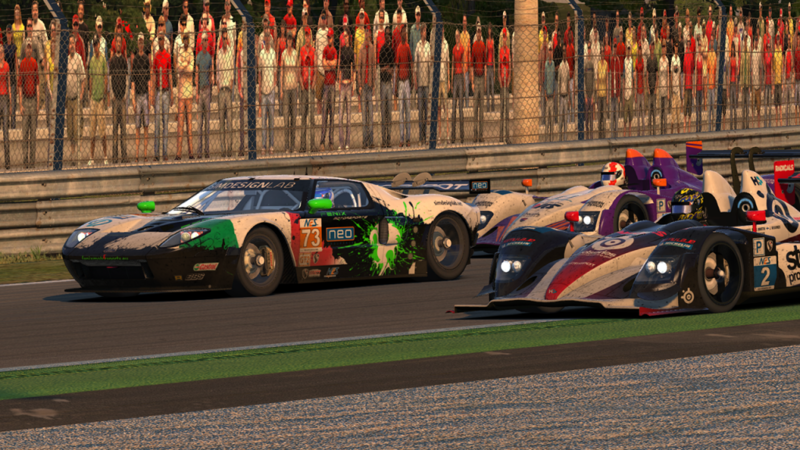 Gathering of Tweakers 2 had the unfortunate incident with the 55 IRDK Endurance car and had to settle for fifth. The 88 Racing Lions Ford GT had a racing incident early in the race with Asbury Motorsports. This cause the Racing Lions to chase the rest of the GT2 field for almost the whole race. Due to bad luck of others the 88 car finished in sixth. Both Asbury Motorsports and Virus blew up their engine in the final period of the race, which resulted in a seventh and eighth position finish respectively for these two teams. SimRC.de already won the championship in GT2. The 78 car showed great speed and consistency so far this season. Fenix Motorsports FGT also clinched second place. The battles for sixth, seventh and eighth are still close and it should be a good triple threat between Racing Lions, Asbury Motorsports and Virus at the Nürburgring. VRS Coanda Simsport again showed that safe is fast. They won the MSF Challenge in Prototype. In GT1 it was Radicals Online who won the MSF Challenge. Torrent Motorsports was probably the only GT2 car who kept its nose clean and this resulted in them winning the challenge in their class. This challenge is sponsored by the Motorsport Safety Foundation. For more information about Motorsport Safety Foundation and their mission, go to their website motorsport-safety.org. Full results and championship standings are available on the website. The race is also available on demand in the NEO race archive or on YouTube. The season finale of the NEO Endurance Series season two takes place at Nürburgring GP Strecke on April 10th at 13:00 GMT. This 8 hour race will be broadcasted by RacespotTV on iRacing Live. Do not miss the final chapter of the season and find out who will win the various championship battles and who will get into the top 8 in the championship and earn an automatic invitation to the next season.